The company is trying to turn itself from being just a brick-and-mortar company into a digital one because of major consumer shifts from a retail perspective. People are always connected and are becoming more demanding and discerning. They’re always on the go and time-starved. It recognizes that, with a more diverse population, people are seeking a lot more variety of things as well as healthier options in an increasingly urban setting. To be truly convenient, it has to go beyond location, to go to its customers. Its 7Rewards program, which started as a coupon machine, then used member identification so it could scan and track purchases, was the beginning of its CRM. It needed to evolve. Simplifying the registration process, adding Facebook Connect. Awarding 800 bonus points to join and be accelerated into the first tier. Putting a mechanic in that allows people to accelerate how fast they earn points, with a mix of proprietary and partner-funded items and combos based on sales data. Using machine learning to do analyses more quickly. It launched in the U.S. in early 2018 and was then being marketed with a million-points giveaway sweepstakes campaign. The company hasn’t been able to leverage credit card data to establish its CRM because its transactions are most often made in cash. The focus, then, is predominantly on personalization by incorporating things that are local and personalized to an individual’s pace and environment. It is conducting a small test to re-engage inactive users. And it has identified people who have “expired” and what types of things it lost them on. Adding in external data, it used the results to target a small group to get them to come back in, purely with email. A pilot program in the Dallas-Ft. Worth area is experimenting with delivery and click ’n’ collect with a separate app focused on pre-order for pick up and delivery. It is trying to extend itself beyond its wall and offer the same level of convenience wherever the customer is so that the customer has a simple experience. 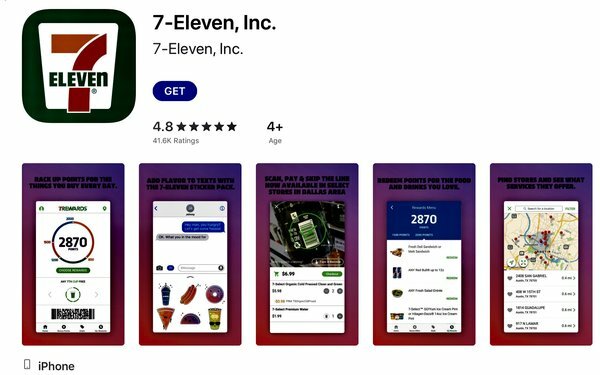 7-Eleven is targeting groups, testing to see if they are the right ones. Currently, says Kinch, it is the only one with an app that delivers beer and pizza in 30 minutes if you live in the Dallas area. Not on the app yet but something coming down the road is a connection between click ’n’ collect and its rewards program. Also in the future are: the potential to self-order at the grill in store; expansion of its pilot with Facebook Messenger, wherein a chat bot is trying to do loyalty acquisition, to include customer feedback; and integration of feedback components with the bot to answer questions. The company is considering more integration between displays in store and on devices to better tell the status of items in store to assure immediate availability. It’s also looking to let consumers order from and get delivery at the gas pump. It has prototypes in Japan that use facial recognition for loyalty and to upsell products. Finally, it may put its Slurpee trucks to use for site-based delivery for certain producers for special events. It achieved a high open rate and got a high number of former customers to come back to the store with its effort to re-engage inactive users.